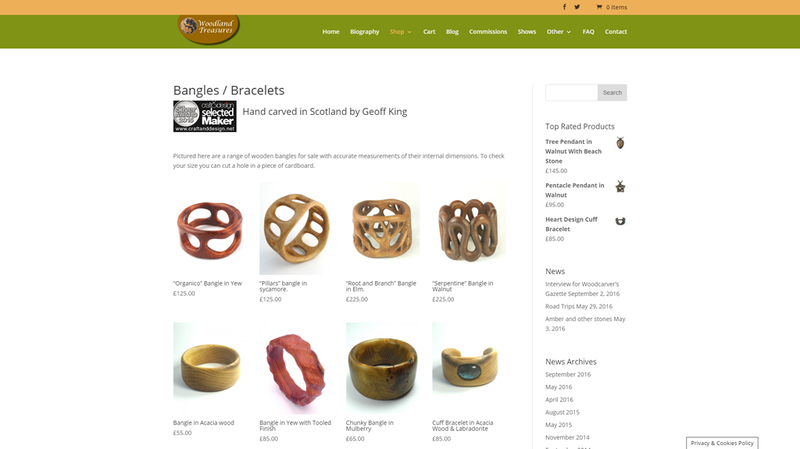 Woodland Treasures sells hand-carved wooden jewellery, designed and made by Scotland-based craftsman, Geoff King. Prior to getting his new site, Geoff had been selling his wares at craft fairs. Geoff wanted to showcase his jewellery and enable visitors to buy online. He also wanted the website to – in his words – “Give the impression of woodland during a sunny day in May”. Once an initial design was agreed, the product side of the site was created which allows visitors to buy online using PayPal. Geoff already knew the key words/phrases that he wanted his website found under in search engines, but extra research into this was carried out and then implemented in the site. Woodland Treasures has a search engine optimisation and marketing package, which includes regular search engine positioning reports so that both Geoff and M35 Design can monitor the effectiveness of the website and, if necessary, act accordingly. The implementation of ‘Google Analytics’ code provides Geoff with visitor tracking information, as well as details of search engine and website referrals to his site. The website also has a statistics package that comes with the hosting. Geoff updates his own site and M35 Web Design provides occasional help with updates, hosting and domain name management. Visitors from all over the world visit the website and buy via the site.